We waved goodbye to Yvonne and Joey this morning and then set about completing various chores like washing and replacing the gas hose with the new one that Joey had brought out. 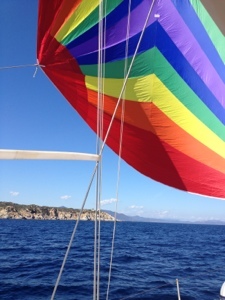 There was not a great deal of wind as it was behind us so we put up our rainbow cruising chute (a big sail at the front of the boat when the wind is behind us). 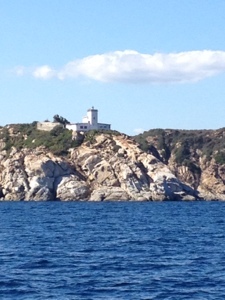 We had a great but slow sail up the west coast to Porto Corallo. We had thought about wintering here but it is in the middle of nowhere with few facilities outside summer. The marina toilets are reminiscent of old French facilities with a hole in the ground! Surprisingly, we declined to use them. Pictures below of our cruising chute and rounding Capo Ferrato.